AUGUST , 2001, ZADAR -CROATIA, INTERNATIONAL ART EXCHANGE PROGRAM BETWEEN MOBIUS AND ARTISTS FROM ZADAR, A STREET INSTALLATION : "AFTER GOTOVINA"
When I arrived in Zadar, prosecutors for the Hague tribunal announced the indictment of Croatian General Ante Gotovina for atrocities committed during army operation "Storm" in 1995. The Croatian army led by this general expelled thousands of Serb, Muslim and Roma (Gypsy) civilians from so-called "Croatian territories". Many of these civilians who refused expulsion were killed. Gotovina, a native of Zadar, proclaiming innocence, refused to surrender to the tribunal and went into hiding. 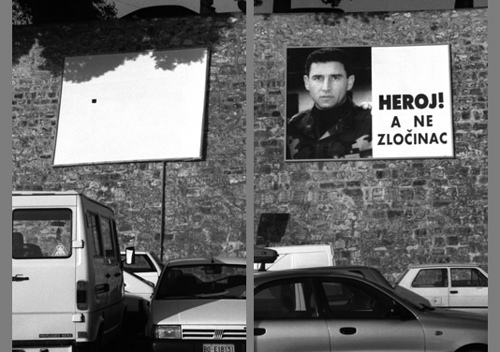 In Zadar, the Gotovina case stirred passions and locals placed a billboard with a picture of the General proclaiming him a hero, not a criminal. The case also brought to life the legacy of past fascism supported by some Croatians. Croatia was a fascist ally with Hitler's Germany during the Second World War and Zadar was at that time a part of fascistic Italy. Gotovina serves for some as an archetype, like Mussolini or Hitler. One of the signs of these ghost feelings are swastikas, anti-Semitic, anti-Gypsy and anti-Muslim statements on the city walls. I made an exact copy of the Gotovina billboard and painted the surface plain white, symbolizing his self-proclaimed innocence. Then I painted a little black square (black is the color of fascism) exactly at the place where there would be a mustache on the face of the General on the other billboard. 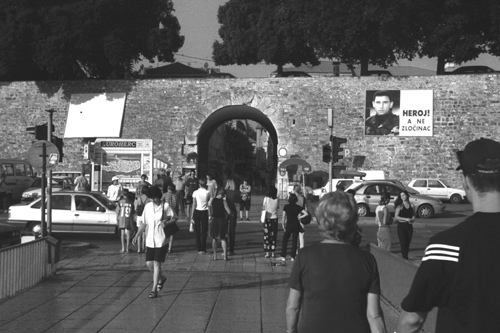 I placed my billboard symmetrically opposite the Gotovina billboard, which was situated next to one of the main entrance gates to the old city. It survived there two days until I was interviewed by both regional newspaper and television and explained my idea of superimposing Hitler's mustache. Within a couple of hours after the newspapers were published, local people apparently attacked my billboard and destroyed it. I was also advised to be aware of a possible attack against me if I went out in public. The piece ignited a passionate discussion among local people and in the regional media. In a subsequent interview I proclaimed and reserved the constitutional right for freedom of speech, which is provided by the Croatian constitution, and demanded that respect for expression, even opposing opinions, should be developed in society.